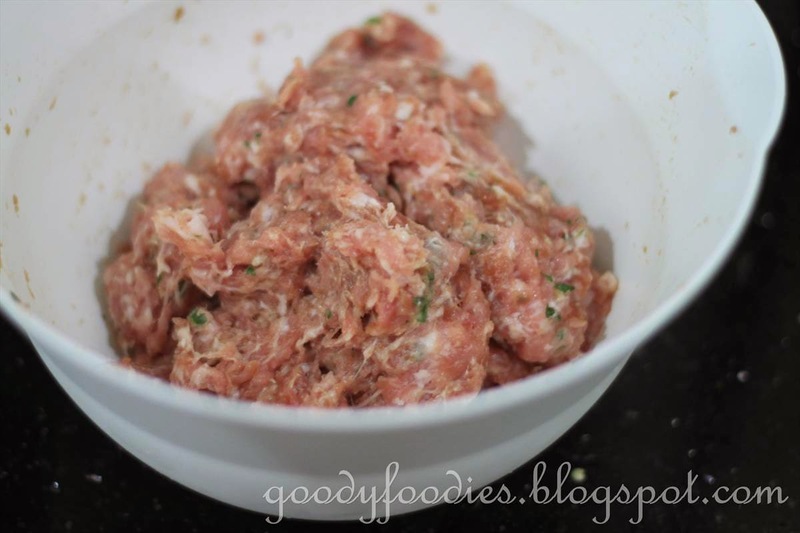 All you need to do is mix the minced pork with the seasonings and herbs, then shape them into sausage shapes and wrap in cling firm. 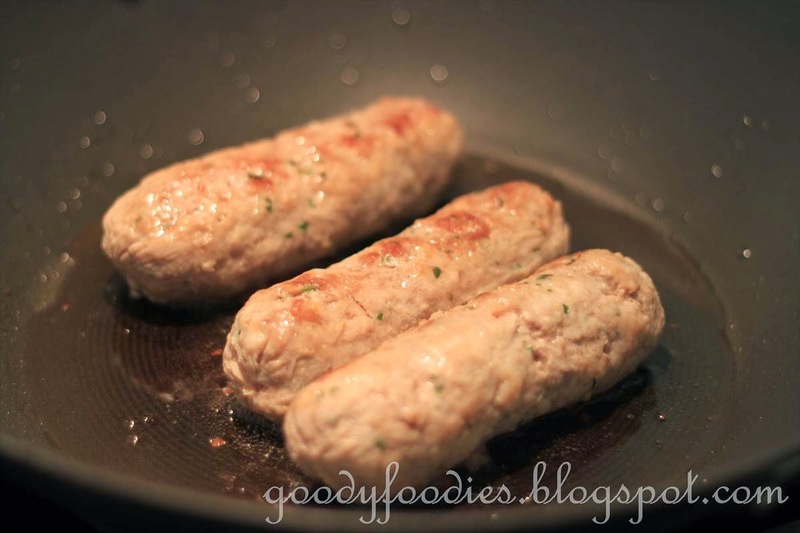 The sausages are then gently poached until cooked. You can have this either cold or warm by browning it in a pan before serving. The flavours for this cha lua is quite mild, with hints of chilli and fish sauce coming through. 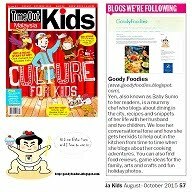 The kids loved this a lot (maybe the cute colorful toothpicks helped?) 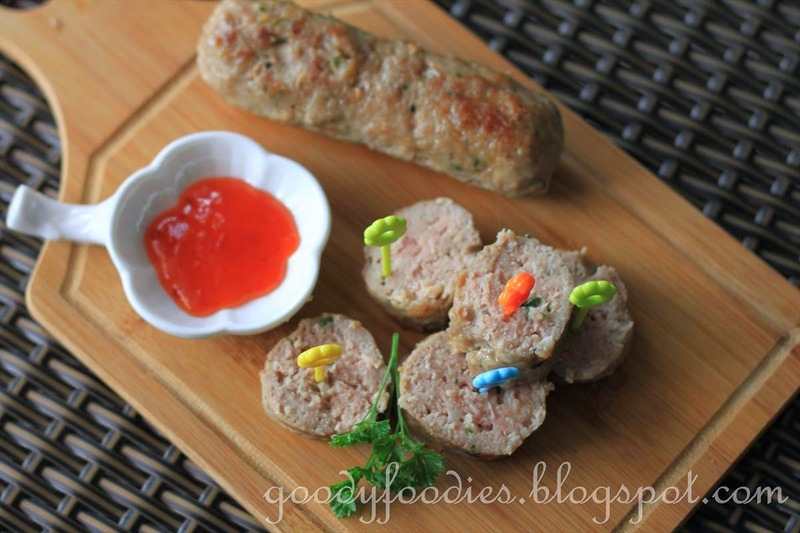 and were eating this non-stop, dipping it in the sweet chilli sauce as they ate.This is one sausage I am happy serving to my kids, since I know it's made from scratch from natural ingredients. 1. Place the minced pork in a large bowl, then add fish sauce, rice flour, sugar, coriander, and red chilli and mix well. Using your hands, form into 3 sausage shapes. 2. 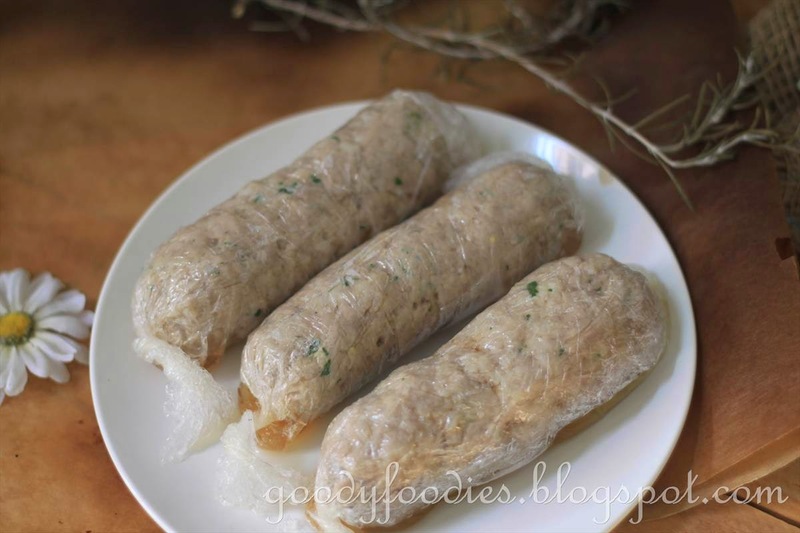 Wrap each sausage tightly in cling film, twisting the ends to keep the roll firm. Refridgerate for 2-3 hours, then poach in very gently simmering water for about 20-25 minutes. 3. Remove from water and set aside to cool, then refridgerate for a further 2 hours, until firm. 4. 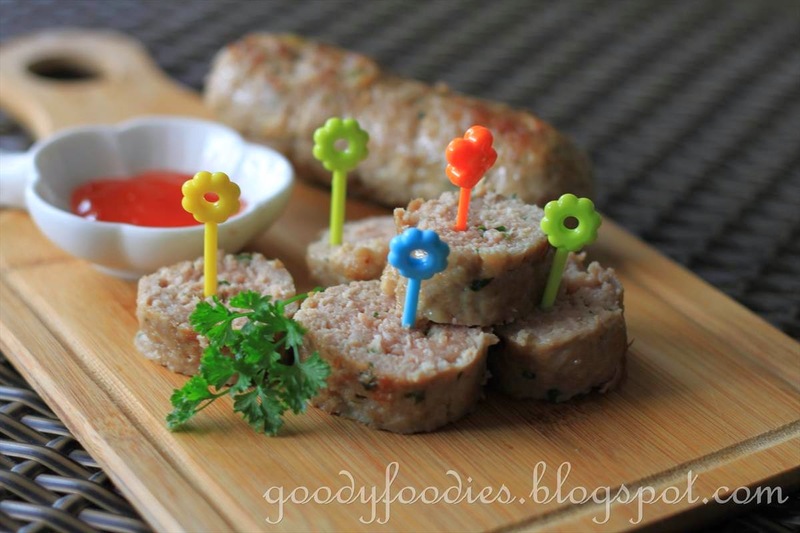 You can serve this sausage cold (slice and serve with toothpicks or in lettuce wraps with mustard, chilli sauce or Vietnamese dipping sauce). Alternatively, you can serve it warm - remove from cling wrap, then brown in a pan with some oil, then slice and serve. Note: You can also use lean pork + pork fat, and place it in the food processor to grind to a sticky paste. 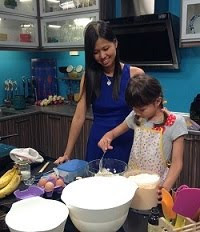 * I am submitting this post to Asian Food Fest- Indochina hosted by Kelly Siew Cooks and to "Cook-Your-Books #13" hosted by Joyce . Yen, took me a few seconds that this sausage didn't have casing, haha. Very good idea! Thanks for sharing! Yen, this is a good time to start making our own sausages! Wow! I love the fact that it is without casing too, I hate the rubbery casing of store bought sausages and usually peel them off before eating...looks yummy! 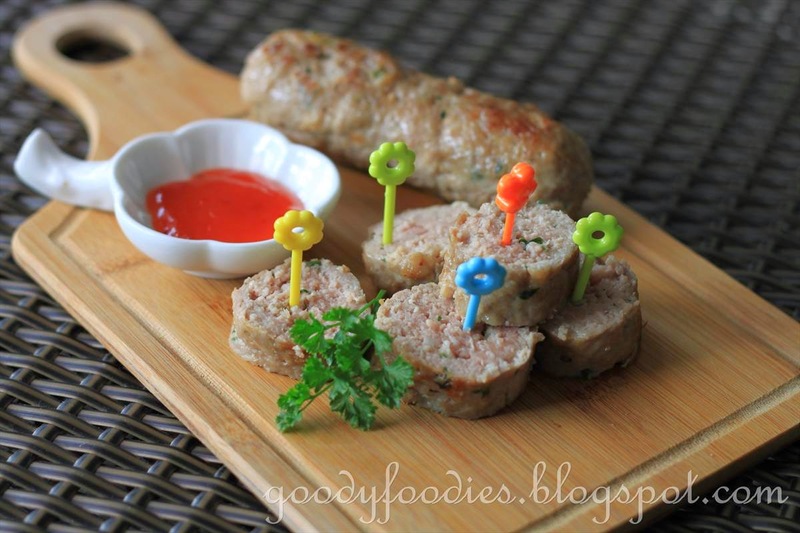 This is one of my favourite sausages but I never knew the name of them. Thanks for the recipe! 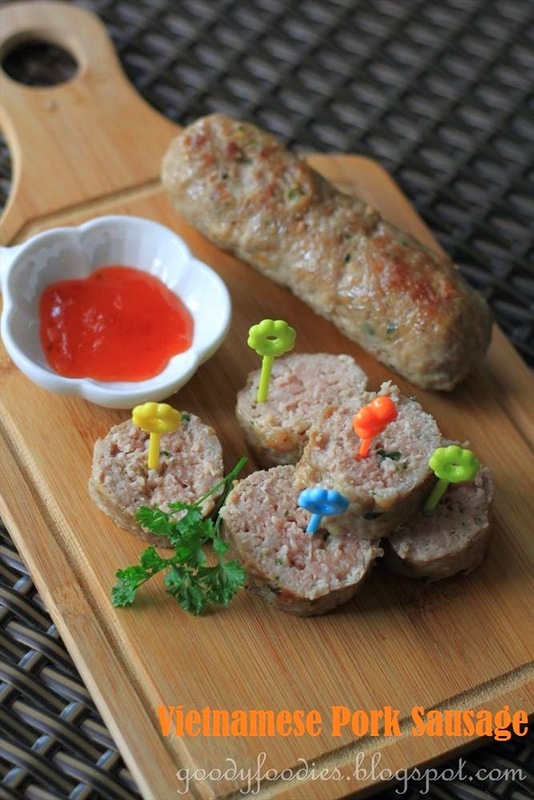 Hi DZ, yes you can replace it with chicken or beef (though I dont think u can call it Vietnamese sausage anymore). Try to use a cut with some fat/skin on or else it may be a little dry. As for the cling film, it is up to you whether u wan to remove it or not. If you plan to poach with cling film on, please use food grade microwave-safe cling film which can withstand up to 100C. I think it will be ok to take off if it has firmed up nicely too and rmbr to poach at a very gentle heat. Oh? 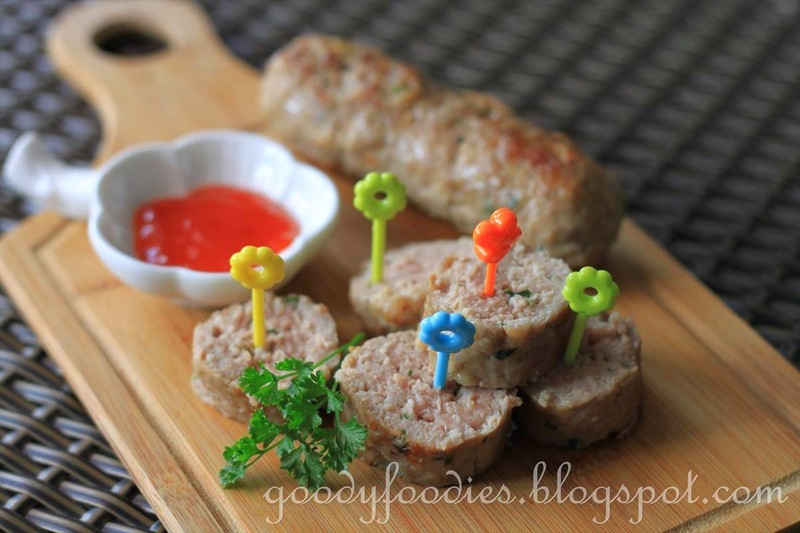 Pork sausage eh? We call them meat rolls or lo bak...or here, we call them ngor hiang, five fragrance - I think they add a bit of five spice powder in the making. Seldom tried this , usually will go for their rolls. Looks great ! I know I can trust you if you say it’s delicious. Totally intriguing! 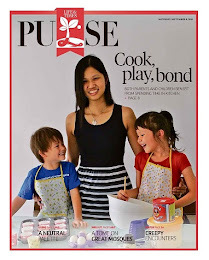 Oooh I had no idea it's so simple to make, must try it one day. Thank you for your support! Yum yum, sounds delicious, must try. Thanks for sharing.